The New Zealand government has supported PNG with NZ$15 million (K35m) to host the Asia-Pacific Economic Cooperation (APEC) Summit in November 2018. New Zealand High Commissioner Sue Mackwell officially signed the documents today in Port Moresby with APEC Minister Justin Tkatchenko. 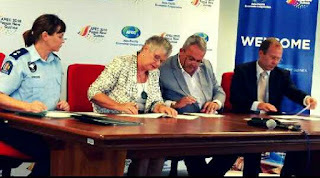 New Zealand was one of the first economies to support PNG’s bid to host APEC 2018. In 2017, the New Zealand government established a NZ$8 million APEC Fund to support PNG’s host year. “We have now completed the assessment of the first round of applications to the fund. The Fund is available to PNG, New Zealand and international partner agencies to submit proposals for funding towards initiatives to support the planning and delivery of APEC 2018 across security, logistics and policy areas. Meantime, APEC Minister Tkatchenko thanks New Zealand for their continuous support and friendship with PNG. The funding includes support to PNG’s APEC Business Advisory Council (ABAC), protocol and liaison training, the contribution of a senior New Zealand Police contingent of 11 officers working under PNG-Australia Policing Partnership in support of the Royal PNG Constabulary’s training and preparations.